Apologies for the lack of recent posts, I have been in and out of the office a lot lately. However I am back up and running now ahead of our next forecast that will be released Nov 29. Yesterday some of the most important economic numbers for Oregon were released. I’m not talking about jobs, or wages, or taxes paid. Rather, I’m referring to the Portland State Population Research Center’s preliminary 2017 population estimates for Oregon, and cities and counties. [Press release here, data here] These numbers matter considerably because they are the official state estimates used for distributing shared revenues, land use laws, and the like. However it should be noted that PSU tends to be more accurate than Census estimates in real time, for these intercensal years. Now, the 2017 numbers will be certified and made official next month but let’s dig into them a little bit with a high level look. Our office’s baseline outlook has called for population growth to slow overall as the economy transitions down to a more sustainable, longer-run rate. In an earlier post we looked at surrendered driver licenses at Oregon DMVs which is a good leading indicator. That showed that population growth had likely topped out. Well, the latest population data shows that overall population growth statewide did not slow in 2017, but it does appear to be topping out in the near future. The second derivative has turned negative. 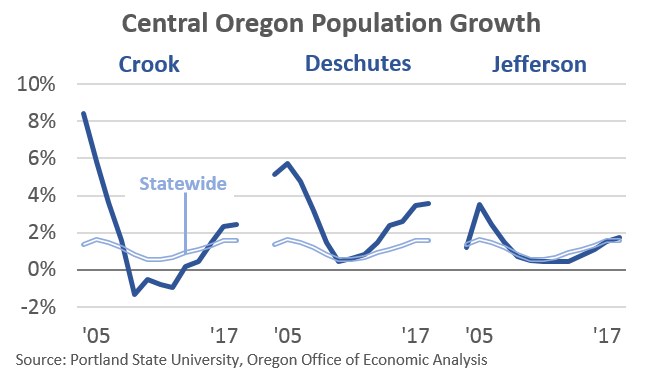 Specifically, the new PSU numbers show that in 2017 Oregon population increased by 64,750 or 1.59% which was a bit stronger than in 2016 when the state added 62,505 new residents for a 1.56% increase. 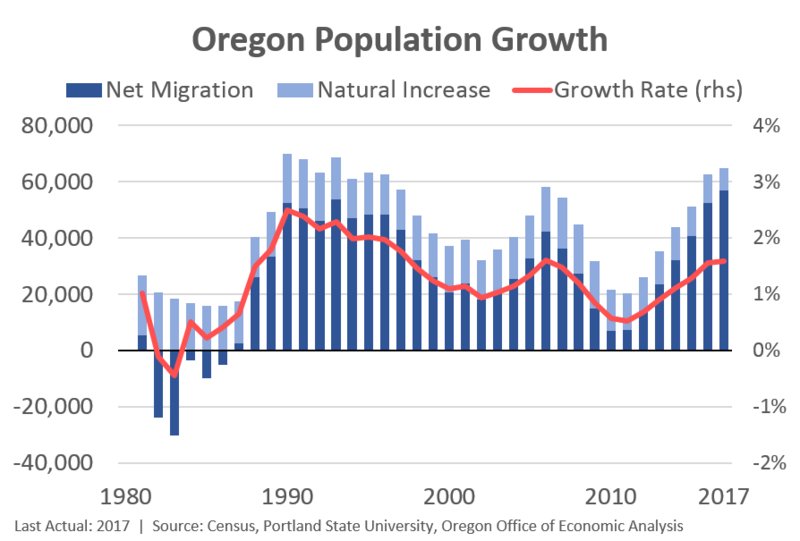 Net migration drives the vast majority of Oregon’s population gains, particularly as the natural increase continues to slow. That is, births still outnumber deaths in Oregon, but that gap is narrowing. Our office still believes slower population growth is the right near-term outlook, however it did not come to pass in 2017. Along with these new numbers, our office will be updating our statewide population forecast in the near future to take them into account. I will post Kanhaiya’s new outlook when he finalizes it. Looking across the state, every single region and every single county added population in 2017. 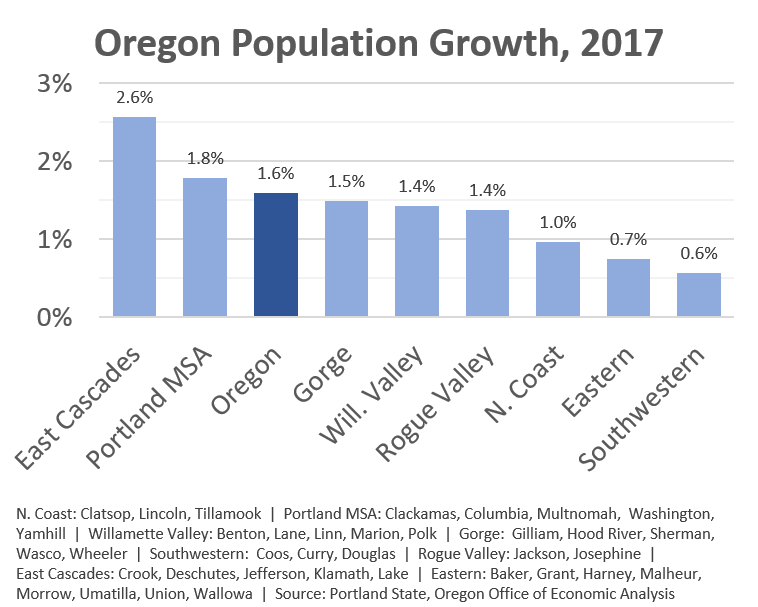 Some faster than others of course, but all parts of Oregon are growing which is good news for the regional economic outlook. Of course the type of population growth matters, and we will get more detailed population data in the coming months. For now, PSU has released the total numbers and they show positive trends across Oregon. Finally, for those interested in the county level figures, the trellis chart below compares local population growth trends with the statewide average. Again, every single county added residents in 2017. Every county saw population growth in 2015 as well. Only one county (Grant) lost population in 2014 and 2016 while all others saw gains. So we have now seen, essentially, 4 years where every part of Oregon is growing again. Given the robust gains during the housing boom/bubble in Central Oregon, we have to put them on a separate chart in order to not mess up the axis on the trellis above. While similar in pattern, Central Oregon has returned to super-charged growth rates. Stay tuned for more on regional and local population trends in the coming months as our office works to update our outlook and PSU releases additional information early next year. Additionally, I will have a bit more on decomposing the gains in the Portland (and Seattle) areas, looking at City vs Suburbs and the like. Thanks for the analysis. Great charts! For the most recent 12-month period, a key takeaway for me is that net migration was the largest number of people ever at about 57,000. Those roads in the Portland metro area are getting more crowded … and fast. The bulk of population increases were in the Portland metro area, with Multnomah, Washington and Clackamas counties accounting for half of the state’s population increase.